The all-new Generation 12LTE. Lightweight Meets Luxury. The Generation Light (Generation LTE) boats are a new category of Console RIB Tenders designed to give you much of the styling and innovative features of the popular Generation DLX yacht tenders, in a lighter construction. The Generation 12LTE is available in different seating configurations to give you the best layout for your needs. 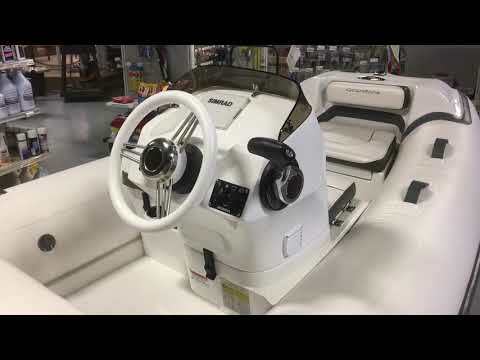 The 4-seat option has a pedestal console base and open layout to give more leg room and space in the boat to move around. The 5-seat option gives more seating and comfort, and includes an insulated cooler. Both options come with two stainless steel cup holders. The Generation 12LTE has been designed to be the most spacious and comfortable boat in its class. The Generation 12LTE boasts 4″ deluxe cushions and ergonomic dimensions. The console base and rear seat are raised, giving the 12LTE a noticeably roomier feel than any other boat in it’s class. It also has significantly more foot room for the driver and passengers, and can comfortably seat 5 adults. In addition to its comfortable interior, the Flared V-Hull in the Generation Light provides the perfect combination of a smooth dry ride and early planning performance. The Generation 12LTE comes in under 700lbs, with a motor, fuel and a battery in most of its configurations. The Generation 12LTE is built using Walker Bay’s proprietary Composite Micro Stringer system bonding the hull and deck into one piece making the the boat lighter and stronger. The result is a boat that better absorbs chop and is quick to plane.